After being president, Hayes retired to Fremont, Ohio where he would die of a heart attack on January 17, 1893. Meanwhile, He spent time talking about his beliefs that all children should have the chance to go to school, that people who had been in the military should get their fair payments for their service, and that people in prisons should be treated better. ↑ "The Rutherford B. Hayes Presidential Center". rbhayes.org. Retrieved July 1, 2010. 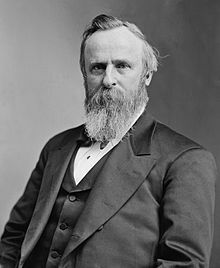 ↑ "Rutherford B. Hayes". npg.si.edu. Retrieved July 1, 2010. ↑ "American Experience . The Presidents . Rutherford Birchard Hayes". pbs.org. Retrieved July 1, 2010. This page was last changed on 23 October 2018, at 16:04.